Fully equipped for the Far North. The Kid's Icefjord Jacket is designed for freezing cold temperatures. For winters at home or in the icy fjords of Scandinavia, this jacket offers exceptionally reliable warmth. Beneath the robust, windproof outer fabric there is a functional mix of hydrophobic duck down and a fast-drying, easy-care synthetic fibre fill. The benefits of this combination become particularly evident in extremely cold, damp climates. In areas more exposed to dampness – the hood and shoulders – Jack Wolfskin have used an extra warm synthetic fibre insulation material, which is less sensitive to moisture than down. 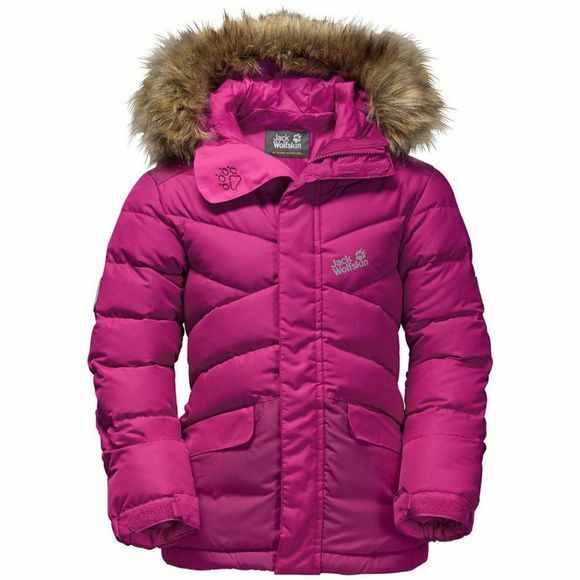 The jacket also has a warm, fake fur trim on the hood for added cosiness in sub-zero temperatures and snowfall. Your kids can stash their penknife, compass and snacks in the two roomy hip pockets.